Nvidia have today launched their latest Maxwell GPU to the masses. And the GeForce GTX 960 is most definitely a card for the masses—as their latest mid-range graphics card release it has been designed to hit the 'sweet-spot'—1080p gaming at high settings at a decent price point. The GeForce GTX 960 follows in the footsteps of the GTX 760, GTX 660 and GTX 560 before it. Inside is the new GM 206 GPU, built on the same Maxwell graphics architecture as the GTX 980 and GTX 970. Obviously we're talking about a smaller scale chip here though, with 'just' 2.94 billion transistors as opposed to the 5.2 billion in the GM 204 its bigger brothers use. It uses just eighty SMM modules to support it's 1,024 CUDA core count, and with that comes sixty-four texture units and thirty-two ROPs. The big news for the specs sheet is that it's only running a 128-bit bus compared with the 256-bit bus the GTX 980 and GTX 970 uses. Nvidia is using the same memory compression algorithms it used in the top Maxwell cards, so effective memory bandwidth is boosted, but it's still short of the old GTX 760. But Nvidia is looking for the GeForce GTX 960 to replace even older cards. 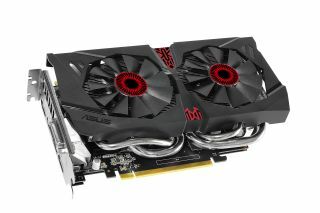 They estimate that two of three PC gamers are currently using either a GTX 660 or older GPU in their gaming rig. We're putting the finishing touches to our GTX 960 review, but first impressions are that this card just about does what it needs to. Compared with the AMD Radeon R9 285 it just about has the edge at 1080p, but it's a rather close call. Pricing is going to be key for a new mid-range card and at around $210 (£180) it's about where you would expect a top 1080p gaming card to be, and means it's definitely bumping heads with the Radeon..